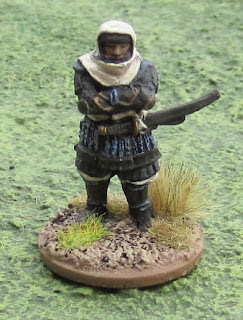 I finished up a Sohei Buntai for Ronin – Skirmish Wargames in the Age of the Samurai over the weekend. All of the figures are from Perry Miniatures. The Grand Master – This fellow I actually painted previously, I’m just showing him here again for completeness. 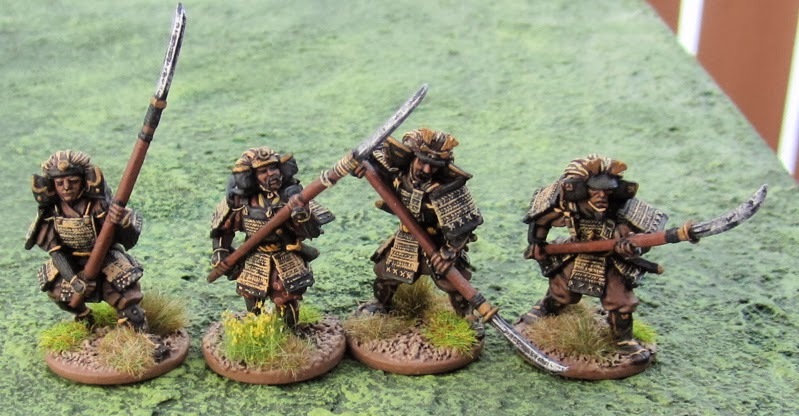 The Ronin list says he should also have a Tetsubo, Yumi or Naginata, but obviously this fellow (along with the two senior Sohei below) obviously doesn’t have any of those, so I figured I’d just give him an attribute in exchange - as they are the same point value. 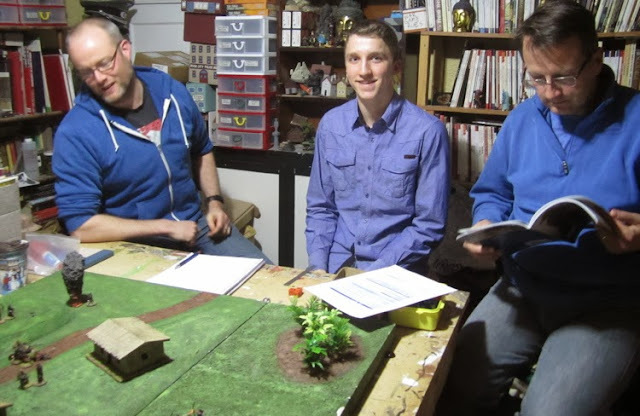 The force so far totals about 300 points – depending on what optional attributes were taken. 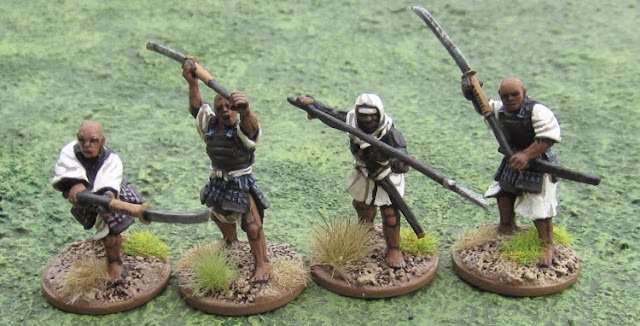 To fill it out to 400 points (for the master list in the campaign) I’d take a few more Sohei and Initiates. 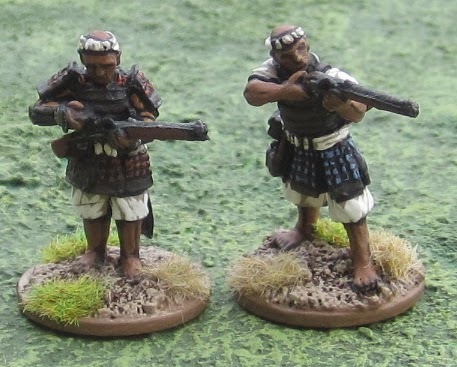 I won’t ever have miniatures for them, as the whole 400 points would never be fielded together. 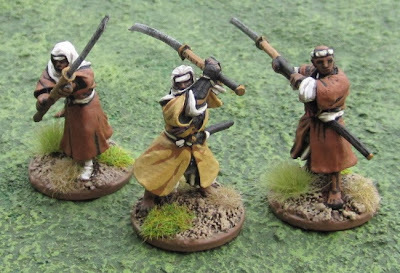 For a 150 point force (which is what we’ll be using on the tabletop in the upcoming campaign) it could be fielded with the Grandmaster, three Sohei and an Initiate or a Senior Sohei with two Sohei and three Initiates or – if you were wanting numbers on the table – a Sohei and all six initiates!? Actually that last option wouldn’t really be legal as they couldn’t take both teppo… but you get the idea… four to seven could be fielded for 150 points. 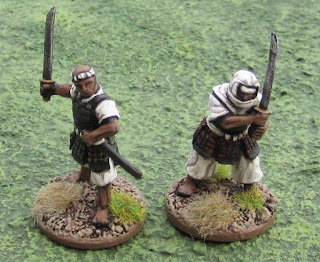 There are cheaper Temple Attendants that could be taken… They are unarmoured and armed with Yari… I could possibly use some of the peseants…? This will likely be my last post for 2013 - so I hope you all have a happy new year. This also means I've painted way more than I purchased this year! Woo-hoo! Now if only I can keep that up for the next decade or so I will eventually run out of stuff to paint! 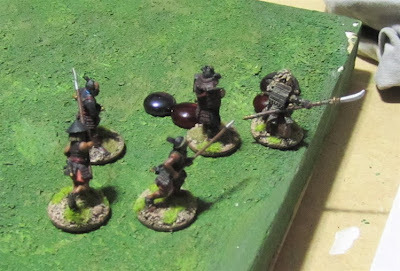 I’ve been working on an Ikko-Ikki Buntai, which is also made up of Perry Miniatures (which could just as easily be fielded as Bandits) and some Perry Ashigaru teppo gunners for various other Buntai. 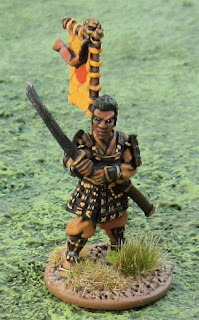 I've also been finishing up a few assorted Dixon Miniatures and Black Hat miniatures. They won’t be posted until the new year because, as part of the Analogue Hobbies Painting Challenge, everything has to be posted over at Analogue Hobbies for 24 hours first. In fact they may not even show up on Analogue Hobbies until tomorrow if I run out of light before I finish them all up this afternoon. 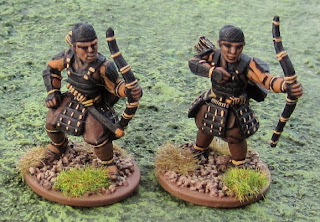 Two unarmoured Samurai or Ronin with Yari from Black Hat Miniatures. Three unarmoured Samurai or Ronin with Naginata from Black Hat Miniatures. Two unarmoured Samurai or Ronin with Yumi from Black Hat Miniatures. Two unarmoured Samurai or Ronin with Katana from Black Hat Miniatures. More of the same. I’m pushing to finish 1000 28mm foot miniatures by the end of the year – which will mean about 10-15 per day for the next three days… I was thinking I might bust out some Great War stuff just to stop going cross-eyed trying to do individual intricate patterns on every damned figure and paint something that might take a bit less time... but then decided just to push ahead with the Japanese. 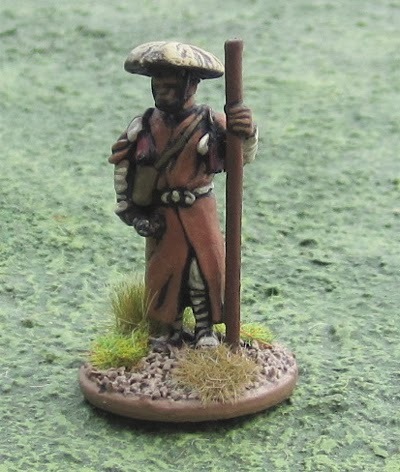 I'm just finishing up some Monks (as well as a few others) which should hopefully be up on Analogue Hobbies tomorrow some time..
My first submission to the Fourth Annual Analogue Hobbies Painting Challenge. This volley temporarily catapulted me (temporarily) into... well... fifth place. This would be so much easier if all I had to do was NINJAS!? 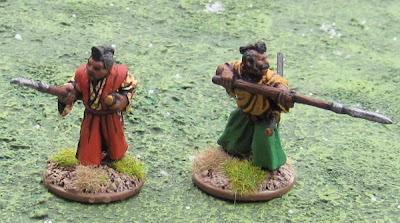 Between Xmas and new years I should have some spare time to catch up… Though as most of the stuff I’m going to be painting for the next 8 weeks before the 10th Annual Wargaming Birthday Bash/Winter Wargaming Weekend will be samurai in corded armour… Miles and miles of corded armour... What was I thinking!? This batch is from Old Glory Samurai Villagers pack. There were 30 in the pack – most of which I painted years ago. Of the 30 there were about 3 each of 10 different figure/poses. 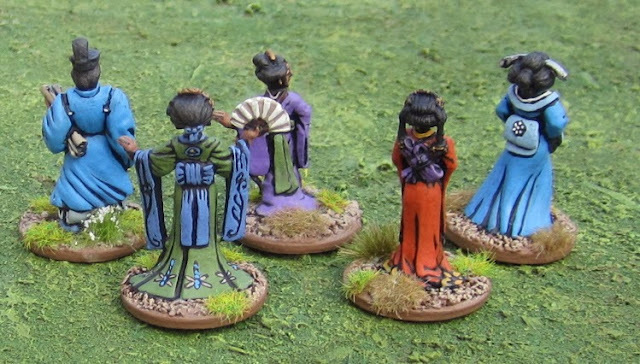 Only one of which was female and looked like a courtier or geisha… Ah well… It’s better than the Vietnamese Villagers pack I got from West Wind Productions that had no women at all! 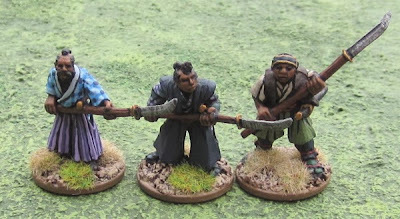 These are from a Perry Miniatures Villagers Pack. I really like this pack – I’m tempted to buy another – I think Perry is the only manufacturer of Samurai era women villagers – all the other women are gussied up courtier/geisha-types. 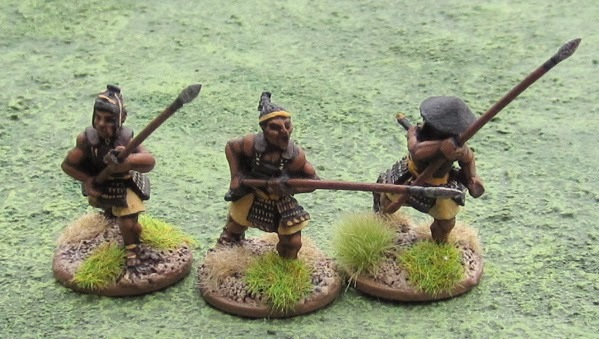 These are from a Perry Miniatures Townspeople pack. Again a great selection of poses. If you do like these figures, please feel free to go vote for them on the Theme Bonus Round Poll - while you’re there check out all the other fabulous submissions – and vote for some of them too - it’s an open poll – you can vote for as many as you like! One more odd thing... not really a miniature I PAINTED per se - this is a Reaper Bones ghost of some sort that was cast in some semi-transluscent green - all I did was base it. Looks like I have 60 to go to make it to 1000.... with 8 days left that's 7.5 per day... not sure I'm going to get any done today (trying to get the last bit of hardwood floor down...) so if I start tomorrow tha's more like 8.5 per day... I wonder if I DO have any Ninjas squirrelled away somewhere...? 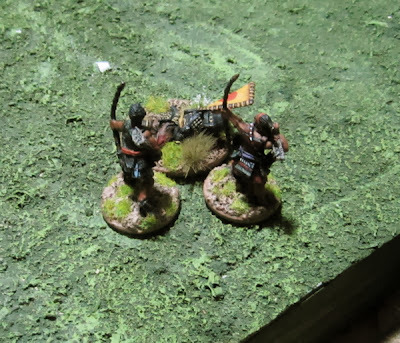 The kids have become interested in painting miniatures this year. 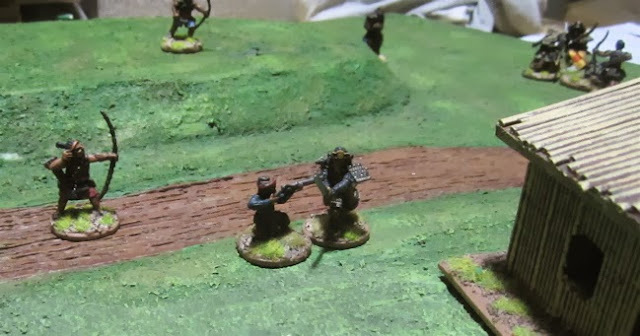 The Girl LOVES painting miniatures and burns through them like crazy! The Boy… he likes having miniatures… but doesn’t love painting them like his sister does. 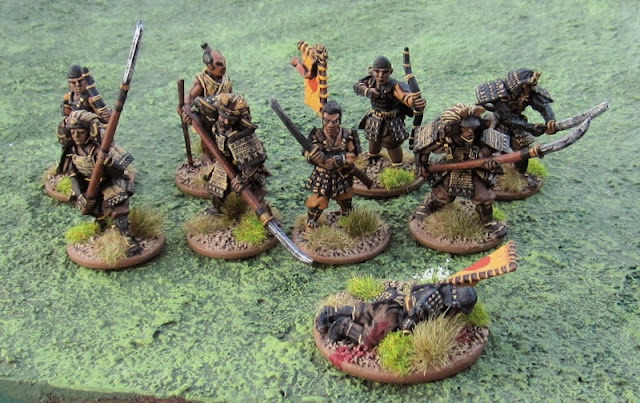 A few weeks back I noticed Wargames Factory was having a bit of a sale and all the Samurai/Ashigaru were 40% off!! 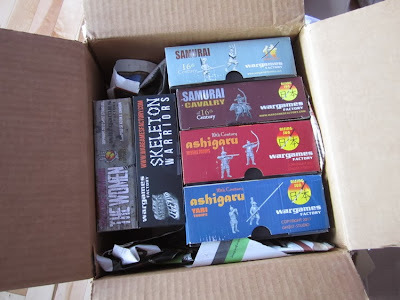 I’m going to split up those packages – there’s five sprues in each and I thought I’d give the kids two each and try and convince Amanda to assemble and paint the figures on the remaining one to have her own Buntai and run a family Ronin Campaign! The other two boxes (the Zombie Apocalypse Female Survivors and the Skeletons) are additional ones The Girl has been asking for that I picked up to save for her birthday in May… Or whenever she runs out of samurai to paint… which might be about the end of January…!? 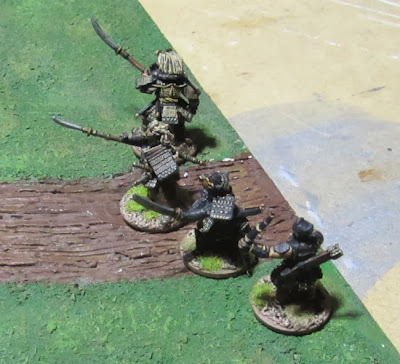 Finnegan actually made his own 150 point Bushi Buntai (with my figures) he picked them out according to the Buntai composition rules. 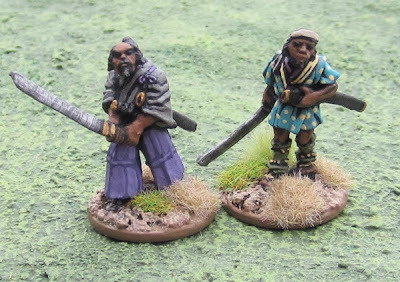 He spent a long time going over the list and reading all the attributes and ultimately he went for a smaller group of hard-hitting Samurai. I went for numbers and fielded the Teppo I painted a few weeks back. We tried out the Capture Scenario. 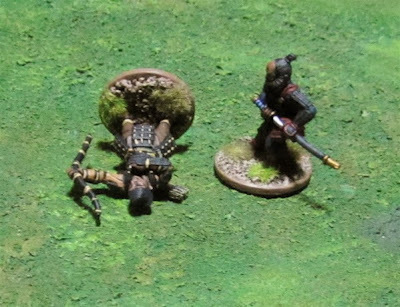 Both of us were to try and recover the body of a slain leader in the middle of the field of battle. Carting the body off the table or being in control of it at the end of the game was worth 5 victory points. The game was to last 8 turns. Crab Clan Bushi Buntai - Me! 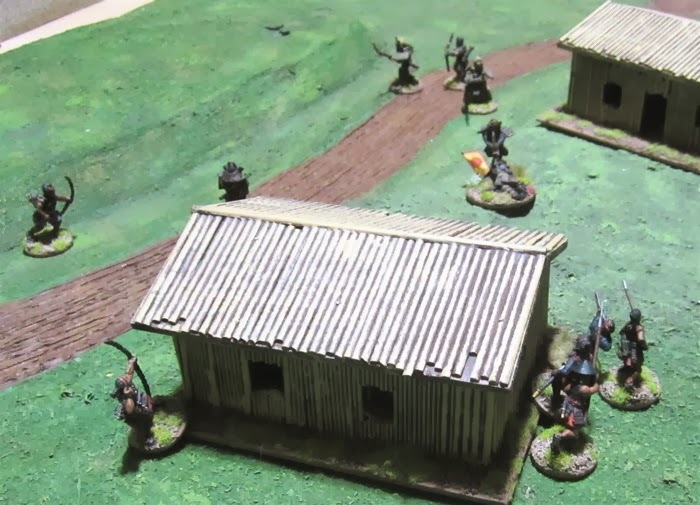 My Crab Clan Bushi enter the field of battle in a gaggle – trying to take cover as they approach the buildings. 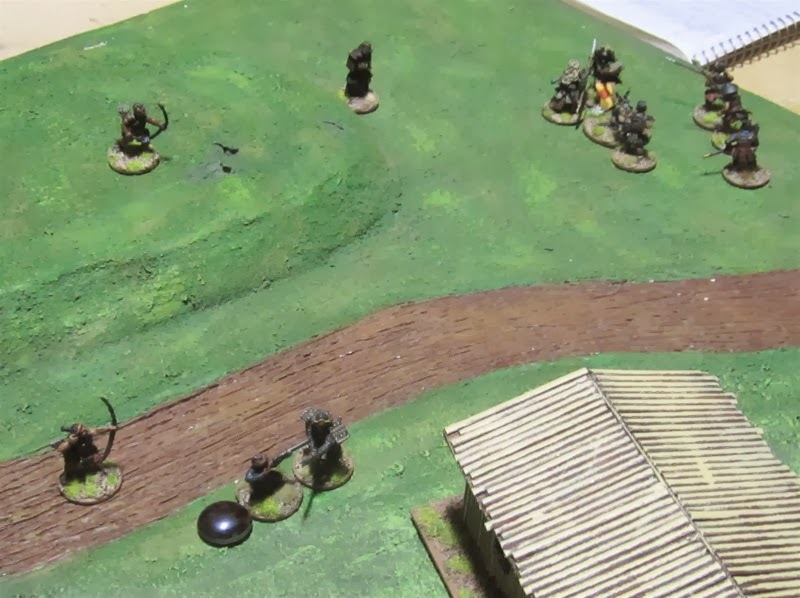 End of Turn One – my guys are all taking cover, Finnegan’s boldly striding about the field of battle. My archers had taken some pot shots but didn’t even come close. 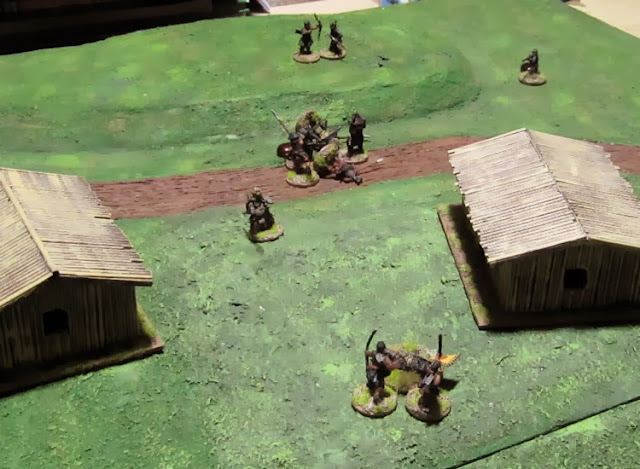 Some fancy maneuvering to try and split up his force and catch the samurai carting off the body on their own. Still with the ineffectual shooting. 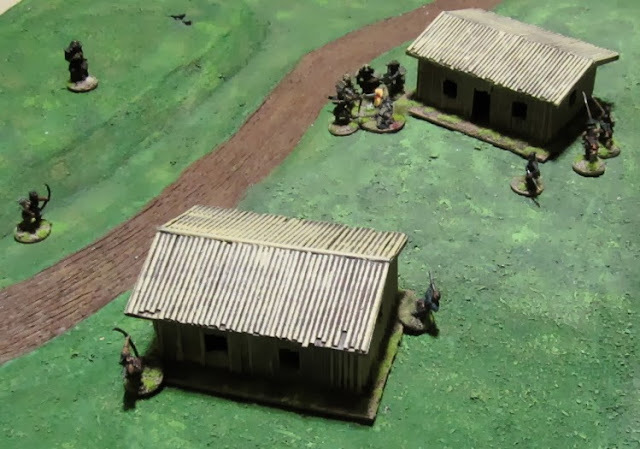 I’d reloaded the teppo and ran up as close as I could – hoping to get them in close, if not point-blank, range. I kind of figured the Hatamoto would fall back to protect his samurai carrying the body… boy was I wrong. Lesson learned – never move within 6” of a Hatamoto that hasn’t moved yet! 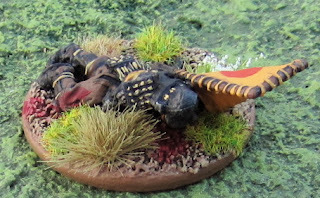 I played all defense tokens hoping to NOT DIE and keep the Hatanoto busy… That’s why my Teppoman didn’t die outright in the first round of close combat. 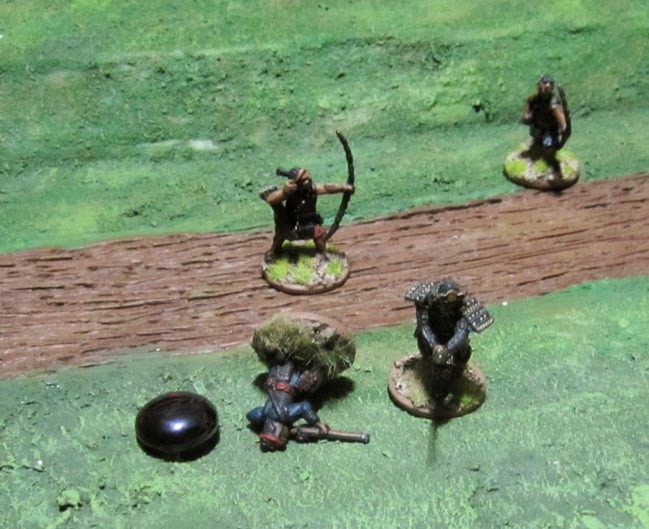 Samurai about to haul the body off the table in the background there… if only I could get priority and engage them first…. No such luck – Finnegan got priority next turn and off the table they went. 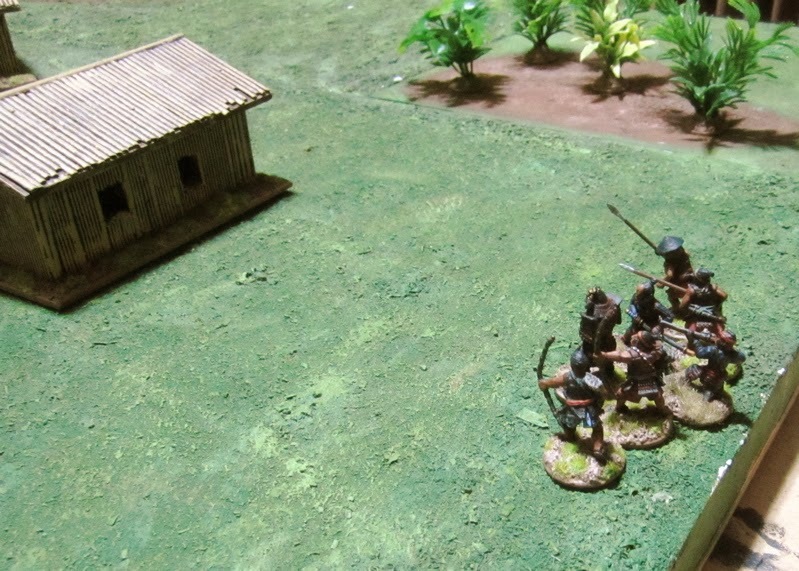 My Hatamoto tried to engage the Lion’s Boshou, but she fled. 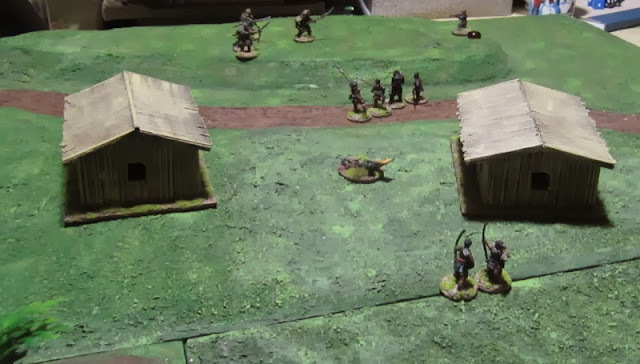 So my Samurai and two spear-wielding Ashigaru tried to chase her down. My only hope of winning (or not losing as badly) was to take out the Bushou and Hatamoto to close the victory point gap. Should have just ran from this dude… The archers had stood around trying to fire arrows at him – into the close combat – but couldn’t even scratch him. 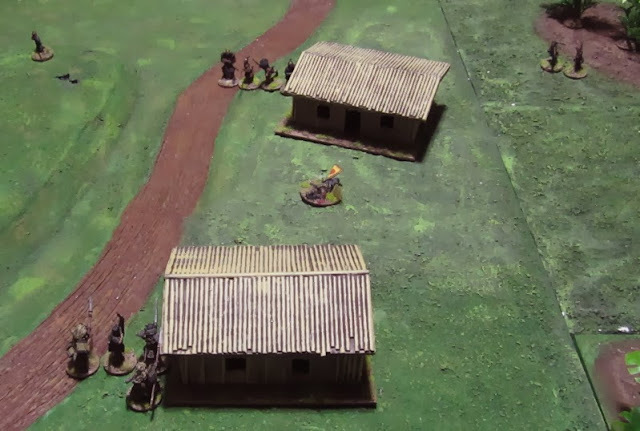 for their folly he chased down and killed one of them after the teppo man went down. My Hatamoto and the lion Bushou finally came to blows. 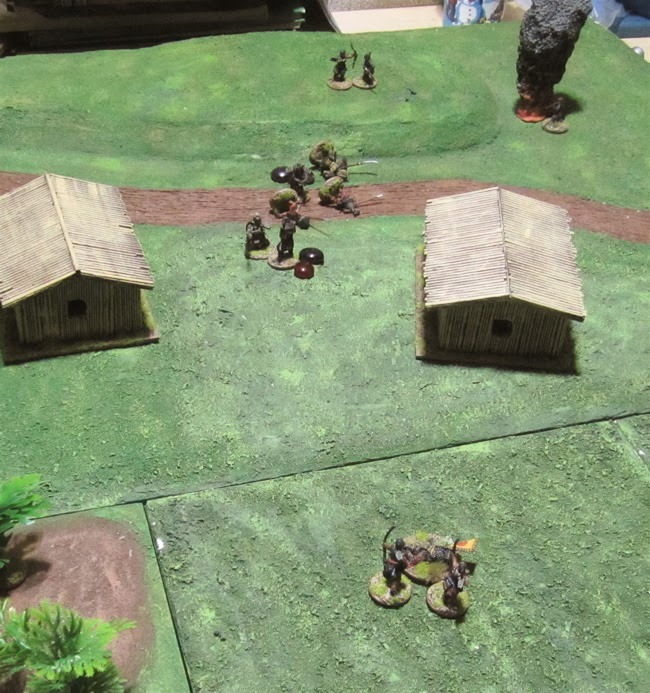 I think she got the initiative and cause my hatamoto a grievous wound… I took ALL attack tokens and got in two enhanced attacks and took her DOWN! The Teppo wasn’t the hero-killer I feared it might be. Maybe in the hands of a samurai and/or with a hojutsu ability it might be a bit nastier. With the severe limitations on how many can be fielded I’m not too worried. As mentioned we tried the Capture Scenario again. 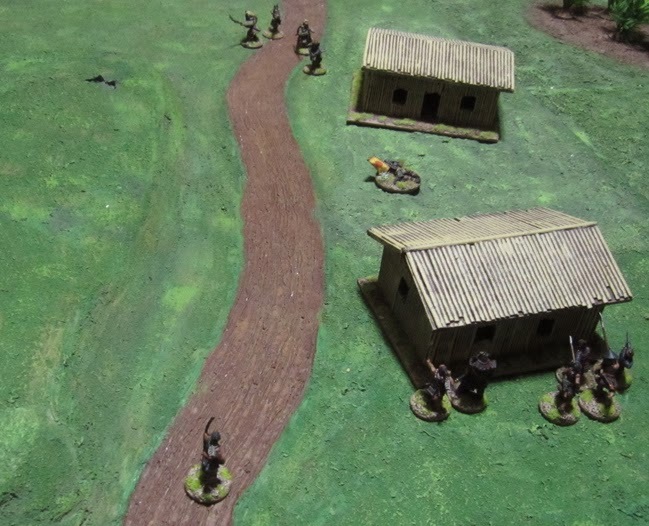 Both sides were to try and recover the body of a slain leader in the middle of the field of battle. 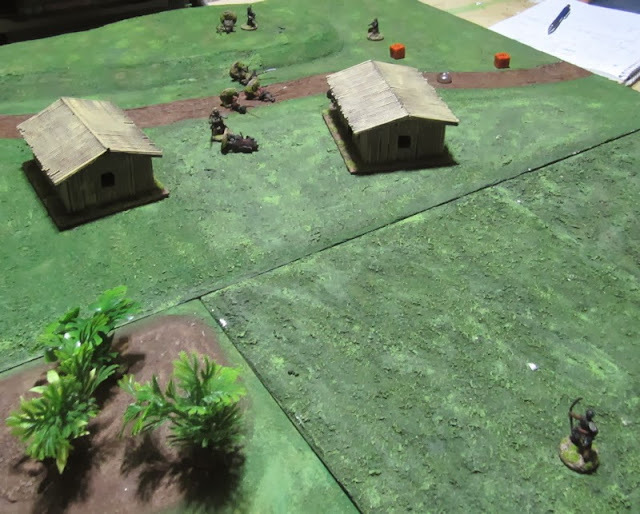 Carting the body off the table or being in control of it at the end of the game was worth 5 victory points. Patrick (in the middle) played the Crab Clan Buntai. 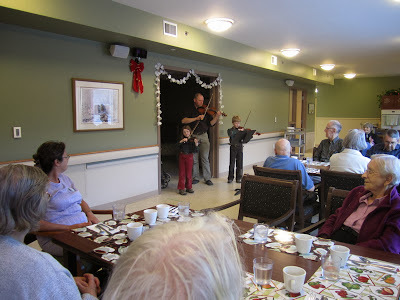 Christian (left) and Dave (right) watched on to try and figure out what was going on. Rick played the Lion Clan Buntai. 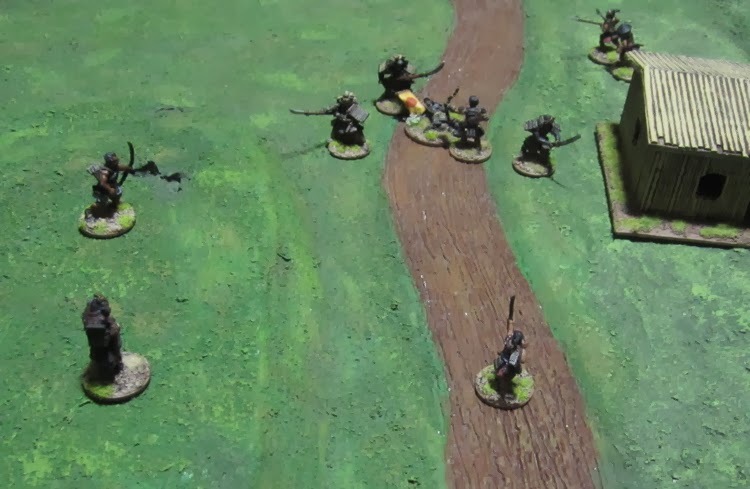 Turn One – Patrick sent his shooty Ashigaru out on the flanks to get into a position where they might be able to cover their guys going for the prize. 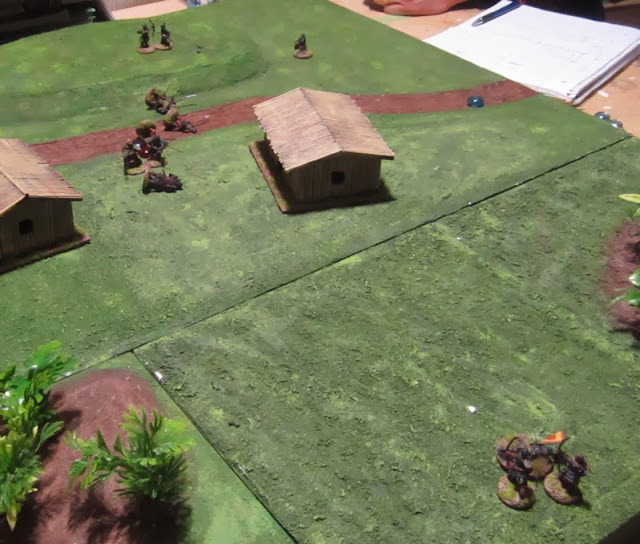 Turn Two - Rick’s guys then flanked to the left – I think to chase down the teppo-gunner…? This kind of left the objective wide open for Patrick’s Ashigaru archers to seize and make off with. 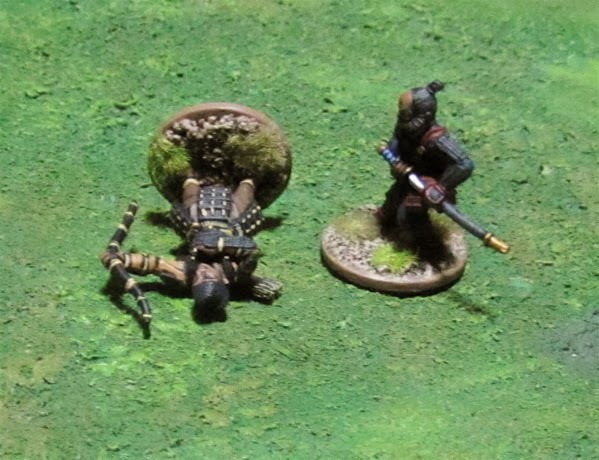 The Teppo-gunner had been hit by Rick’s Samurai archer. He fired back but missed. The Crab Samurai rushed forward to keep the Teppo-gunner from being overrun while he reloaded. 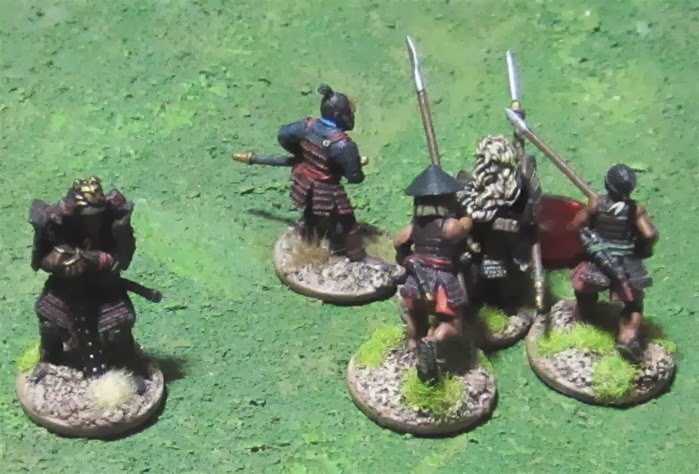 Realizing the Crab Archers were making off with the body, the Lion Bushou charged down the kill past the melee – where the Crab Hatamoto was cutting down a Lion Samurai and the Lion Hatamoto was chopping his way through yumi-armed Crab Ashigaru. 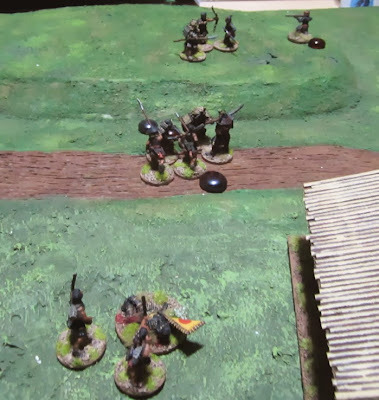 Having dispatched his samurai opponent the Crab Hatamoto charged the Lion Bushou to tie her up and keep her from chasing down the Ashigaru carrying off the body. She cut him good for his insolence – inflicting a grievous wound in her first blow! The Ashigaru made it to the table edge unmolested! 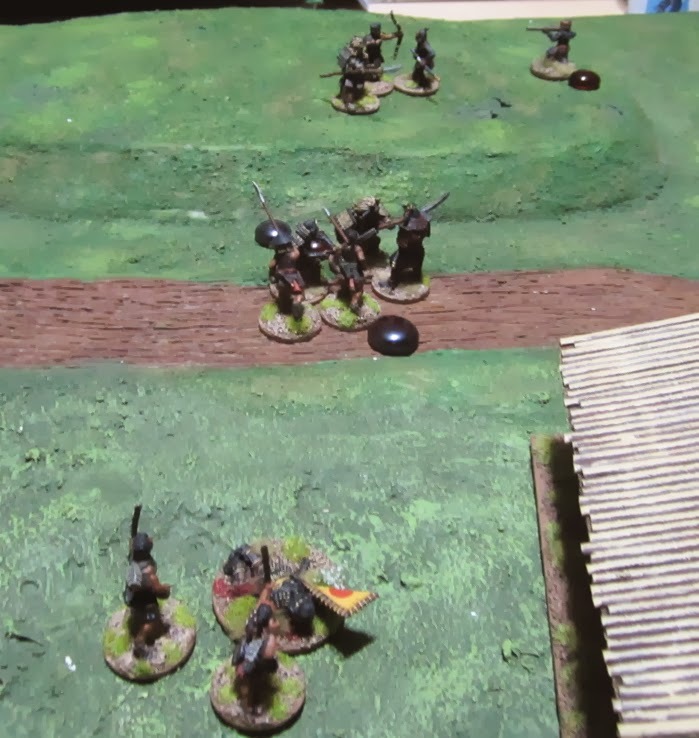 These two samurai has been going at it toe-to-toe on top of the hil since turn three – on the final turn the Crab finally got the best of his lion opponent. The mess at the end of the battle. This game took about two hours, but we stopped to have a few little chats about the rules and mechanics and to look up a few things we forgot or were never really sure of. I think these 150 point games of 3’x3’ table will be easily playable in 1.5 hours or less – once we get the rules solid in our heads. Hopefully we’ll be able to get in a few more games over the holidaze. over at Analogue Hobbies - I finished off ALL of the Japanese courtiers, villagers and townspeople I had – 27 in all. I’ll post the picture here on Monday. I should get going on my next volley – more Samurai and Ronin and Ashigaru…. 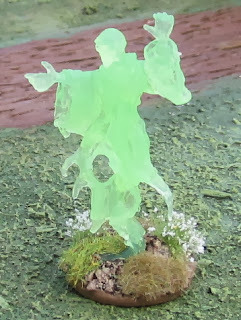 Some of the stuff I’ve been basing and priming over the last week or so.. There's just over 200 minis there. 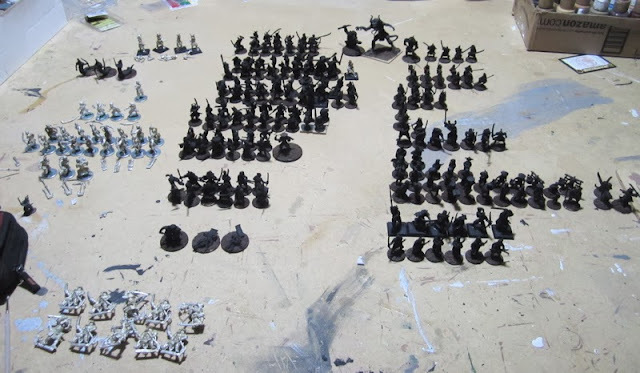 I hope to have them all - and a few other new one's that are on the way - done by the end of February for the 10th Annual Wargaming Birthday Bash/Winter Wargaming Weekend. Production has slowed somewhat over the last few months, but typically over the holidaze I get quite a bit done. The Batch I’ve finished up over the last couple of days. 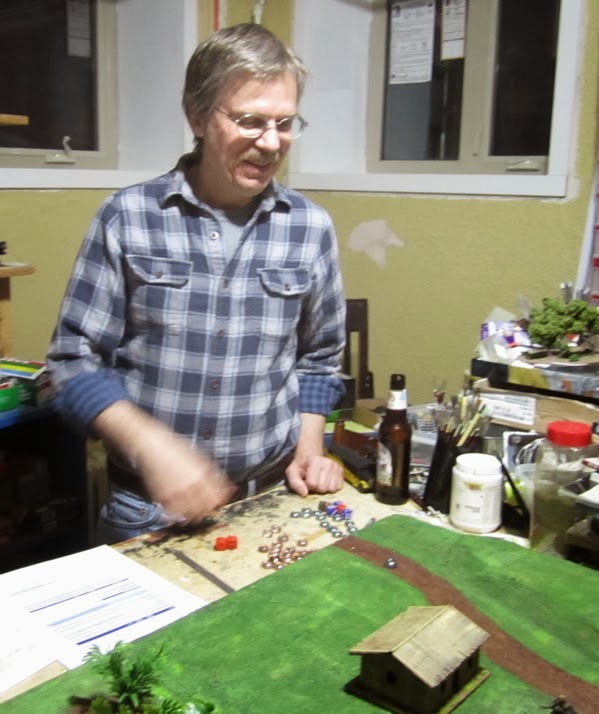 (Not counting towards the Fourth Annual Analogue Hobbies Painting Challenge because they were all started before today… by at least a couple of hours!). Most were finished up while I was watching 13 Assasins. 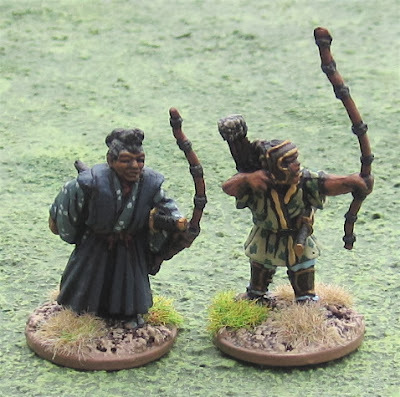 Two Archers also from AEG. Hmmmmm… not sure… Game report? I’d hoped to get in a game last night, but no one showed. Maybe I’ll get some games in with the kids this week.